The Columbia City Farmers Market starts up again on April 27, with over 30 farmers and food vendors selling a delicious assortment of early spring greens, organic poultry and meats, fabulous cheeses, fresh eggs, wild salmon, and seasonal plant starts and cut flowers. In addition to the farmers' offerings, the market has a tantalizing selection of prepared and ready-to-eat foods. and Panacea Food makes seasonal prepared dishes featuring what's fresh on the market tables, as well as sauces, dressings and condiments that compliment the farmers' fresh offerings. Early in the season farmers are harvesting spring greens and lettuces (including wild greens such as stinging nettles & miner's lettuce) and the freshest, best asparagus you can find! Farmstead cheeses: goat milk cheeses from Port Madison Farm, cow's milk from Appel Farm and Mt. Townsend Creamery. You can also grab a beautiful loaf of bread from our very own Columbia City Bakery. Also check out the market's healthy, excellent-tasting, organic and grass-fed chicken, beef, pork and eggs from River Farm and Olsen Farm; St. Jude Tuna, and Pacific Northwest wild-caught salmon from Loki Fish, including their own salmon jerky and smoked salmon. As always, the Columbia City Farmers Market accepts EBT/Food Stamps, WIC and Senior coupons, helping low-income families to take advantage of the fresh, healthy offerings at the market. Young shoppers can also visit the kids tent for some fun games and crafts. The market will have weekly schedules of music, food events and special activities for kids throughout the season. All events are free and open to the public. 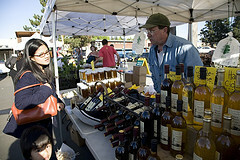 Go to seattlefarmersmarkets.org for seasonal updates and events listings.